Luton equalled a club record of 27 league games unbeaten and took yet another a huge step towards playing Championship football next season with a 2-1 win at Bristol Rovers this afternoon. With Sunderland and Portsmouth not in action, the two sides facing each other at Wembley tomorrow in the Checkatrade Trophy final, Town went into the game knowing it was a huge chance to put real daylight between themselves and the chasing pack. They did just that by showing both sides of their game too. A superb first half performance in which James Collins and Luke Berry scored, Jonson Clarke-Harris pulling one back for Rovers just before the interval, was then followed by a second period where the visitors professionally saw the game out. It enabled Town to win for the first time at the Memorial Stadium in their history, as they also won a league game on their travels against the Pirates for the first time since 1980. Boss Mick Harford made two changes to the side who had hammered Doncaster, with Collins back from international duty to partner Kazenga LuaLua upfront, Danny Hylton missing out due to injury. Midfielder Berry came in for Dan Potts as well, the full back failing to recover from his knee injury, meaning Alex Baptiste was on the bench. After an early Rovers effort, Tom Nichols' shot kicked away from the line by James Justin, the Hatters took over. Monopolising possession and territory in the early stages, they moved in front with a move of glorious simplicity on 17 minutes, Andrew Shinnie, Jack Stacey and Collins combining as per usual. As he has done so often, Shinnie drove forward from midfield, perfectly finding the run of overlapping Stacey, who delivered a wonderful low cross for an unmarked Collins to tap home goal number 21 of the season at the back post. Luton looked for a second, Collins almost picking the pocket of a defender, keeper Jack Bonham there in the nick of time. LuaLua the might have doubled the advantage, found inside the area, but his top corner attempt flew harmlessly over the bar. Berry drilled over from 25 yards, while Collins wasn't too far off doubling his own tally, picked out by LuaLua, a defender making a crucial block. Town then got the second they were fully deserving off on 39 minutes when Justin was found on the left. He cut inside and shot, the attempt deflecting to Elliot Lee, whose touch back was pounced on by Berry to somewhat scuff a shot into the bottom corner for his second goal in two games. It was also the perfect way for Berry to mark a year's anniversary to the day of the horrific double leg break suffered at Colchester United. With Town just seconds away from completing the ideal first half, their defence was breached by a superb individual goal from Rovers' top scorer Clarke-Harris. Pouncing on a ball forward, he beat Bradley for pace and as Pearson tried to get back, raced into the box to beat James Shea, giving his side a real lifeline. Luton should have restored their two goal advantage early in the second period. Stacey was once more the architect, getting round the back of the defence and putting it on a plate for Lee, who leaning back, fired well over from eight yards. Town could never quite regain the level of dominance they had enjoyed in the first half, getting into some good positions, but unable to find the final ball. Rovers definitely tightened up defensively and improved on the ball too, but they never seriously threatened Shea's goal, the keeper mopping up expertly whenever called upon, plucking a number of crosses out of the air. Clarke-Harris almost had an equaliser when left unmarked at the back post, only to see his shot deflect behind by Matty Pearson. Lee's luck was out once more, curling way over from outside the box, as Town rang the changes in an attempt to run the clock down, both George Thorne and George Moncur getting run-outs. They did so with relative ease as well, never allowing the hosts a significant sight of goal even during six minutes of injury time. With news of second placed Barnsley being held at home by Coventry as well, there was even more cause for celebration, as Luton moved seven in front of their nearest rivals, now with just six games to play. Rovers: Jack Bonham, Tom Lockyer ©, Tony Craig, Ed Upson, Liam Sercombe, Ollie Clarke, Tom Nichols (Alex Jakubiak 76), James Clarke, Jonson Clarke-Harris, Abu Ogogo (Gavin Reilly 83), Michael Kelly. Subs not used: Adam Smith, Joe Partington, Stuart Sinclair, Alfie Kligour, Luke Russe. 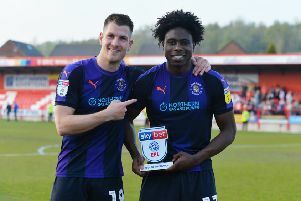 Hatters: James Shea, Jack Stacey, James Justin, Matty Pearson, Sonny Bradley (C), Pelly-Ruddock Mpanzu, Andrew Shinnie, Luke Berry (George Thorne 83), Elliot Lee (George Moncur 87), Kazenga LuaLua (Harry Cornick 73), James Collins. Subs not used: Harry Isted, Alan Sheehan, Alex Baptiste, Jason Cummings.